2 or 3 themes or streams of thought that are related to but separate from the primary theme. These might arise from different parts of the lectionary text. This may also include questions, or alternative ways of thinking about the primary theme. Liturgical elements for the beginning, middle, and end of the worship service. A variety of elements each week, encouraging participation and engagement for the worshipper. All elements relate to the primary and/or secondary themes, to help preachers and worship planners achieve a cohesive thematic flow in worship. Collect, Pastoral Prayer, Congregational Prayer, Responsive Reading, etc. These 700-word essays cover a variety of current and critical topics for the preacher. Each essay focuses on one particular topic. Topics could include the practice of preaching, sermon writing, current issues for the preacher, emerging trends in preaching, and emerging ideas or cultural trends that are important for the church and preacher. Essays are contributed by leading homileticians. The full text from six - twelve sermons will be included in the print and e-book. The full sermons are included as a source of inspiration and edification for pastors, who so rarely are on the receiving end of preaching. These sermons will highlight best practices, unique approaches, and fresh voices. 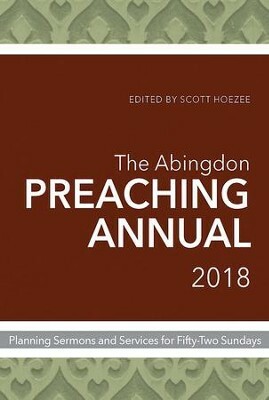 I'm the author/artist and I want to review The Abingdon Preaching Annual 2018: Planning Sermons and Services for Fifty-Two Sundays - eBook.